This page shows an exciting assortment of jewelry that includes SMOKY QUARTZ. Sometimes it is erroneously called smoky topaz, there is no topaz in smoky color. Smoky Quartz is a natural brown or gray/brown color and transparent, a color that is popular as we accessorize often with brown! It can be found with inclusions as a rutilated smoky quartz. See also our selection of Quartz Jewelry in other colors! A faceted sliver of transparent brown SMOKY QUARTZ is shown elegantly raised above the finger, setting is open in the back. Surrounded by smaller PERIDOT cabochons and bits of GARNET. Set in pure silver covered by thick 18kt gold layer, design extends 3/4 inch lengthwise on finger, band tapers to 3/16 inch in back. Size 7.25, not suitable for resizing. 2 inches long including sterling earwire, 5/8 inch across. 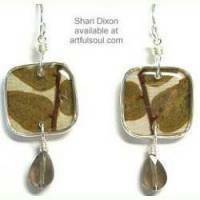 Olive-Brown leaves on a parchment color background are captured in silver plated bezel cup, a briolette cut Smoky Quartz stone dangles below.